The Voyager Old School sees Moog returning to their roots, but is there a place for an all–analogue, 1970s–style synth in the 21st century? The classic iconic look.Photo: Mike CameronAt its inception, the Minimoog was surprisingly close to being the perfect solo synthesizer. Indeed, you could argue that there's not a serious rival for the role even today. Yet soloists demand to express themselves — and there the Mini had obvious shortcomings. For a start, its keyboard lacked velocity and aftertouch, while the pitch–bender and modulation wheels never felt like the final word in performance control. Nevertheless, without becoming lost in the enigma that is the Minimoog, let's agree that it must have possessed special qualities to set it apart from the crowd for so long — even from others in the Moog stable. Would we ever see its like again? In 2001, rumours began to circulate of a revised, regenerated Minimoog, followed by a competition to name Bob Moog's latest progeny. The resulting Minimoog Voyager answered the prayers of many. It was, after all, a monophonic analogue synthesizer from Moog featuring Moog oscillators, Moog filters, wood, MIDI, a responsive keyboard, patch memories and knobs and components that were shiny and new. Throw in patch points for extra control, a dedicated LFO, oscillator sync and waveform modulation and you'd think all the boxes had been ticked. However, some amongst the analogue community worked themselves into a lather, convinced that grafting menus onto a Mini was tantamount to nailing a humbucker pickup to a Stradivarius. Some saw it as cheating to dial up a patch from memory rather than making your own, on the spot, every time. Not even Bob Moog, it seemed, could please everyone. Well, the beardy types' wailing and gnashing of teeth can cease, because there's another new Moog in town — one that rejects all things digital. 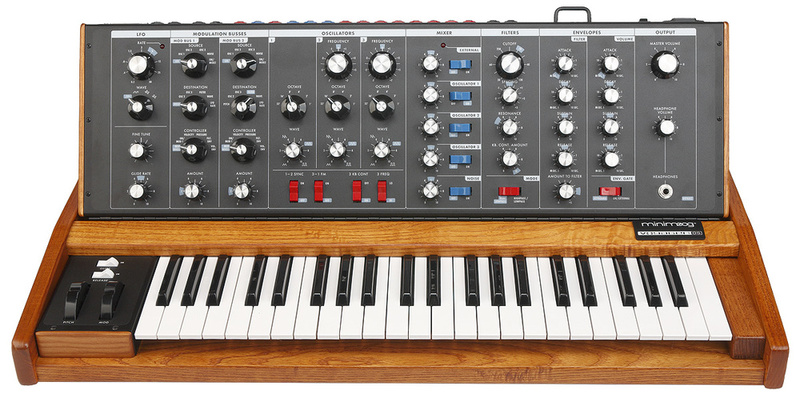 Ladies and gentlemen, let me present the Moog Voyager Old School! Look Mum, no MIDI! The Old School's rear panel offers a host of Control Voltage inputs and an Accessory serial port but, in keeping with its non–digital ethic, no MIDI ports.The Minimoog Voyager OS may take an old school approach but it is, of course, brand spanking new. It's still essentially a Voyager, and therefore a far more complex design than the handful of transistors that comprised the original Mini. However, this Voyager has been stripped back to its analogue heart, losing the upgradable operating system, LCD, menus, patch memories, MIDI and even the (analogue) touch surface. As the two synths are so intimately related, I'd advise you to revisit Gordon Reid's comprehensive review of the Voyager from June 2003's SOS. Here, like some twisted dentist, I'll ponder the impact of the extractions — and will doubtless wallow in nostalgia along the way. After all, merely glancing at the Old School takes me back to my youth — to a time when what you saw really was what you got. This Moog is that rarest of creatures: a modern synthesizer built with ergonomics, layout and style in mind. This is no exercise in feature cramming! Weighing in at a hefty 18kg, the Old School is a serious contender. If you admired the standard Voyager, I think you'll agree its latest sibling wins any posing contest between them — without even needing to pout. The wood finish is superb, the feel of the knobs top–notch, and the 44–key (F to C) keyboard is a delight — it certainly beats any vintage Model D I've played for both speed and responsiveness. On first power–up, the solitary pulsing LED of the Low Frequency Oscillator is understated in comparison to the extravagant light-shows of other Voyager models. This reserved façade blends more naturally amongst older synthesizers, and the lack of a backlit panel or glowing mod wheel should banish any fears of extraneous electrical noise. No Minimoog would look right without its familiar tilting panel. This one offers five operating positions, although (as Gordon observed in his original review), the wooden case is too close to the rear jack sockets to allow you to use them when the panel is laid flat. Looking closely, you'll see that the panel is actually a printed laminate affair similar to those seen on Dave Smith's recent instruments — all very clear and logical. Scanning from left to right, we find the modulation section, consisting of an LFO and two modulation busses. Then the three VCOs, mixer, dual filters, envelopes and, finally, a big, friendly volume knob. Being both right–handed and a compulsive tweaker, I'd love to encounter a panel laid out in exactly the opposite direction, since the filter and envelope knobs seem to be where my left hand travels most often. Fortunately, the angled panel negates any crossed–arm obstructions! Adjacent to every control is a pale–blue mark. This is your designated safe escape route, presumably for when it all goes horribly wrong. Once upon a time we patiently learned to program our synthesizers with patch–book examples and cardboard overlays. Frankly, Moog are the last company I'd have expected to print a 'default' patch on one of its synths — an indelible set of 'L' plates! Mildly exasperated, I turned to the rear (or upper) panel, which is largely the same as the Voyager's. This means lots of quarter–inch voltage inputs (11 in total) for interfacing with expression pedals, or modular gear such as Moog's own Moogerfoogers. An effects loop insert point is provided too, ideal for plumbing in external effects after the mixer section and before the filters. This is one of those simple additions that prove to be genuinely worthwhile in practice and had me digging out a wide collection of old effects processors. Adjacent to the insert point, the external audio input is on hand to process any source you fancy — including the Old School's own headphone output. This version of the Minimoog trick sounds a trifle different in this incarnation; indeed, with the levels cranked up it threw up some of the most extreme (and occasionally scary) noises in the Old School's repertoire. What you see really is what you get — all of the Old School's functions are accessed via the tilting front panel.Scary noises aside, this is a synthesizer that you will want to play — then play some more. Keyboard heroes can emerge from the shadows at last, because the Old School spills forth wave upon wave of rich Moogyness. If you can't cut through with this, then maybe you should invest in a chainsaw instead. Familiarisation with the controls took literally seconds, after which I started to get the kind of buzz that took me back to my earliest days discovering synths. The first area I turned to was modulation — perhaps the most significant upgrade from Minimoog architecture. This consists of two identical modulation busses, each offering six modulation sources routable to six destinations via any of a list of six controllers. I thought this synth was a beast, but I didn't realise it was The Beast! The sources available differ from those of a standard Voyager; they include the three VCOs, the LFO, the noise generator and an external modulation input. These may be routed to overall pitch, the pitch of Oscillator 2 or 3, filter cutoff, oscillator wave or LFO rate. Wave modulation is something you couldn't do at all on a Minimoog, and the only drawback here is that it affects all oscillators — or none; you can't specify a single VCO wave to be modulated. If this isn't as flexible as you might like, it does at least keep things simple. The controller component of the modulation bus has the usual suspects: mod wheel, velocity, aftertouch and both envelopes, plus an external CV or expression pedal. Lacking the menu options of the standard Voyager, the Old School benefits from more modulation controllers on its panel. But as there are only two busses and three main performance controllers, you might not be able to do everything you want in a single patch. For example, if you route velocity to the filter cutoff and aftertouch to wave modulation, you can't then bring the mod wheel into play — the two busses are already fully booked. Here's where that optional VX351 CV Expander (see 'CV Concerns' box) starts to look anything but. I'm sure we all agree that a dedicated LFO is a vital thing to have. This one has a base range of approximately 0.2Hz up to 50Hz, but can be extended considerably by means of a positive or negative voltage at its CV input. There are just four waveforms available: triangle, square, sample-and-hold and smoothed sample-and-hold. Oddly there's no sawtooth — but sawtooth hunters will be pleased to know that, as per the Minimoog, you can draft in one of the three main oscillators for additional low–frequency duty. There's even a switch to deactivate it from the keyboard too, just like old times. In stark contrast to my own (now departed) Mini, the VCOs behaved impeccably, stabilising after just a few minutes and staying that way. Oscillator 1's pitch is set by the main fine–tune control, with the other two oscillators detunable over a range of seven semitones, up or down. The oscillators sound great — from their lowest 32' setting right up to 1', an octave that comes into its own when you start to explore another 'post Model D' trick — Frequency Modulation. At the flick of a switch, VCO3 becomes the FM source for VCO1, serving up wild excesses of discordant metallic tones, adding bite to any solo. Speaking of bite, I was recently impressed by Moog's Freqbox and its rich oscillator sync, and I'm even happier with the Old School's implementation. Draft in a modulation bus giving aftertouch control over Oscillator 2's frequency, and you're in sync heaven. I'm guessing Moog improved the aftertouch response after the original review, because I found it played very well, second only to Korg's Prophecy in my own 'pressure hit parade'. The original Minimoog's single low–pass filter was enough to make it legendary. The Old School has two of them and a switch that determines which configuration you want: parallel low–pass mode or serial high– and low–pass. Choose parallel and each filter is routed to a separate audio output; choose serial and audio is sent equally to both. As has been said before, Moog don't provide a way to access each filter's cutoff frequency individually. Instead, a spacing control sets the interval between them over a range of +/– three octaves. Switch into High–pass/Low–pass mode and you enter thin and raspy territory; if you're looking to break away from blatant Moog power, this could become a favourite, with filter spacing acting as a direct thin/fat control. The ADSR envelopes are positioned vertically and offer a snappy response rated between one millisecond and 10 seconds. I wasn't particularly taken by the way the knobs are calibrated. In the case of attack, the bulk of the knob's travel is occupied by the fastest attacks, and in the case of release, a large portion of the knob's movement translates to very short release times; only the last sliver of pie is available to set a range between one second and maximum. On the review model, this maximum was over 20 seconds, so finding accurate release times proved rather finicky. It's likely that my solos are just too slow and 'new agey', but this is something to be aware of when you audition an Old School. As with the Minimoog, the envelopes default to single triggering. This suits my noodly style perfectly — but could be troublesome if you need fast, articulated phrasing. In such cases, multi triggering is available, but is activated by powering on while holding down the top two keys of the keyboard. Not something you'd want to do live! You must also do this every time multi–triggering is needed, as the status is not remembered. The keyboard employs last–note priority rather than the Minimoog's low–note bias, which I think is an improvement. Lastly, a switch will deactivate keyboard triggering of the envelopes — handy when processing external signals via the filters. 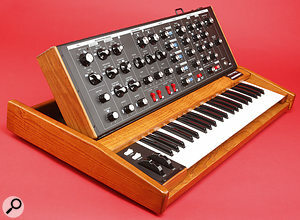 If, before the release of the first Voyager, you had asked me what I would hope to find in a modern Minimoog, it wouldn't have been a hundred miles from the Voyager OS. Its full title, 'Minimoog Voyager Old School', is a bit of a mouthful, though; how nice it would have been to simply say Minimoog Model E! This synth is just as comfortable in a lead performance role as the Model D was all those years ago. One look at the panel and you know exactly where you are; its controls feel just right and they're ergonomically spaced for unimpeded access to a wealth of Moog tones. You're not stuck in the past, though: the Old School has way more to offer, thanks to a dedicated LFO, oscillator sync, FM and the dual filter arrangement. Factor in the twin modulation bus and rear–panel interfacing and the options seem to grow exponentially. There are 896 patches in a V3 Voyager, but I warrant a skilled Old School performer should be able to rustle up the sound he or she wants in the time it takes to locate a favourite amongst that lot — with the advantage that each time it will be a little different. Don't go for an Old School if you insist on absolute repeatability in your music; without memories to draw from, the synthesizer player is forced not to memorise (or write down) each favourite patch but to understand the instrument so deeply that it becomes intuitive. At £500 less than a Voyager Performer, the Old School could be both a money saver and an education. Not everything in the garden is rosy, however. Dropping MIDI seems a cut too many when faced with the challenge of sequencing the Old School via the CV input. A lesser gripe is the difficulty of setting long attack and release times accurately. Admittedly, this could be more about my preference for a particular style of flowing solo than a serious complaint. Actually, if I had to name just one thing that genuinely bugged me, it's those 'default' patch markings. They really spoil an otherwise elegant panel. Yes, I'm a grumpy old man to get fixated on such things — but have we really dumbed down so much in the space of 30 years that this is necessary? To sum up, the Voyager's digital bits were never part of its signal path anyway, but if you feel that this new–fangled MIDI lark and patch memories are cheating, or if you simply dream of a modern, reliable, simple–to–use Moog, the Voyager Old School is exactly what the doctor ordered. Genuine alternatives to the Voyager Old School are thin on the ground, not least because monophonic analogue synthesizers (with or without MIDI) aren't exactly hurtling off production lines. If we peer into the future a little, the forthcoming MacBeth X–Factor promises to be a serious contender, and the Analogue Solutions Leipzig also looks interesting. But for the time being, it's probably another US company that offers Moog the most serious challenge — in the form of the Prophet 08 from Dave Smith. This eight–note polyphonic analogue has MIDI, knobs, a sequencer, patch memories and much more. Admittedly, the endless rotaries don't offer the same instant visual feedback as an Old School and modulation is set via menus, but Dave Smith packs a lot into a compact, affordable synth. Or, for much less cash, Dave's Mono Evolver keyboard with its mixture of digital and analogue technology can't be ignored. If you turn to digital, the Access Virus TI series still sounds fabulous to these old ears although, granted, there's a little menu–hopping to do. Clavia's Nord Wave fares better in that respect, but its mono mode doesn't handle like a true analogue. Like many digital synths since the Korg Prophecy, its envelopes restart at zero on each keypress, reducing my flowery synth solos to something more like an accordion or melodica! Thankfully, the Virus gets that bit right — something to note if you share my fondness for a certain Schulzian Moog style. Despite the Old School's diverse connectivity, a few desirable features failed to earn a place amongst the throng. There's a dearth of voltage outputs, although, as an optional extra, these can be added courtesy of Moog's VX351 CV Expander. This hooks up via a small multi–pin connector and provides access to voltages produced by the keyboard's velocity and aftertouch, as well as the mod wheel, and more. Be aware that this expander was created for the original Voyager, so some of its outputs (for example, that of the Touch Surface) don't apply to the Old School or, in the case of the keyboard pitch and gate outputs, duplicate what is there already. It's fortunate that CV and Gate interfacing are on board, since, with MIDI cast aside, the Old School needs some way to interact with the outside world. In my own tests I found that the keyboard's output voltage was scaled much lower than that of my Roland SH101. Oddly, all notes below the keyboard's bottom C sent the Roland into a spin — although three octaves (C–C) worked reliably. Investigation revealed that the Old School puts out negative voltages for any notes below the lowest C, which some synths (such as the 101) can't cope with. Unfortunately, it was the incoming pitch–CV response that caused me real problems. Driven by the SH101 or by my Kenton Pro 2000 MIDI–to–CV converter, the Old School did not track accurately at all. Moog inform me they decided to omit CV input calibration from the design, and I am advised that the best solution is to use an attenuator from either a VX351 or a Moogerfooger CP251 Control Processor (or a similar module, if you have a modular synth) to tweak the incoming voltage until the Old School plays in tune. Personally, I can live without patch memories and MIDI control of knobs — but without basic MIDI note reception, I can't drive those chuggy Moog basses from a sequencer without added cost or complication. At this point my nostalgia transferred briefly to the dawn of MIDI: the solution to exactly this kind of voltage incompatibility. Obviously, there are tricks a digitally–empowered Voyager can do that are beyond the remit of the Old School — without a menu system, much has to be simplified. Thus, the Old School has no way to transpose the keyboard or set different velocity curves. The pitch–bend range is preset at the factory via an internal jumper, and so is not programmable per patch. The review model was set at seven semitones up or down, but you can change it (from +/– two semitones up to +/– one octave) by following instructions provided on Moog's web site. There's no equivalent of the Voyager's menu–based mod wheel and pedal destinations (or pot mapping), but it was another of the Voyager's hidden aces that I missed the most: other Voyagers let you freely select the number of poles used by each filter, from one, two, three or four. Both the Old School's filters are fixed at four poles, the Moog standard. Handles like a dream . MIDI is gone and the pitch CV input doesn't guarantee accurate tuning without external hardware attenuation. Those 'default' patch markings! Do you really want someone else's idea of a default patch forever etched into your pride and joy? Priced between the Little Phatty and the various Voyager models, the Old School represents Moog's purest successor to the fabled Model D. Its WYSIWYG approach is direct and intuitive, and the synth is a pleasure to play. Although not designed to exactly emulate a Minimoog, it has Moog oscillators, envelopes and filters, so can cover the same ground and much more. £1599.99; VX351 expander £189.99. Prices include VAT. Arbiter +44 (0)20 8207 7880. Moog +1 828 251 0090.